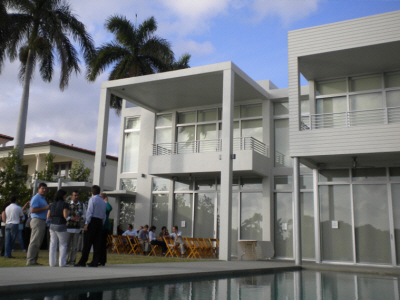 “The Art of Sustainable Luxury” was how the event was billed and on March 25th I was privileged to tour the first LEED for Homes Silver Certified Luxury Residence in Miami-Dade County. What this magnificent 5200 square foot waterfront home shows is that luxury does not need to be sacrificed to low-impact sustainable living. When the owners first discovered the land parcel for their future home many years ago, the LEED (Leadership in Energy and Environmental Design Green Building Rating System) for Homes was still being developed. But by the time they acquired the property, the owners knew they wanted to integrate energy efficiency and environmentally sound elements into their home’s striking design. To help them achieve their goal, they partnered with KZ Architecture; Bell-Aqui, Inc landscape architects; Arbab Engineering, Inc; LNI Engineering; Gary G. Bloom PE civil engineer; and Alejandro Vargas at Visual Lighting. And to supervise the various certifications, the team brought in Gary Shlifer of Green Building Florida; Banks Clark of Environment, Safety and Health LC; and Eric Martin of Florida Solar Energy Center. One of my favorite features of the home is the rainwater harvesting system with a 2500 gallon cistern located under the house and 83% of the roof area dedicated to rainwater capture. The system provides approximately 80% of their annual irrigation needs. Ninety two percent of the home’s finishes (paints, adhesives, etc) were no VOC (Volatile organic compounds) and the home was built with a wood-free insect resistant structure. In Florida, with our termites, carpenter ants and humidity, wood-free construction seems like such an obvious choice, doesn’t it? The list of sustainable elements incorporated into this home was several pages long and included everything from dual-flush toilets to an exterior ceramic coating that insulates the home the way ceramic tiles insulates the space shuttle for re-entry. With all of the amazing attention to detail, the homeowners will realize almost 30% improved energy efficiency over similar new construction homes built to Florida Code in the same time period. In addition, they diverted 88% of the construction waste away from our landfills. Without a doubt, this home provides a model for what other luxury home developers and owners can accomplish. For more information and photos of the home, visit KZ Architecture online. And for more information about Miami real estate, don’t hesitate to give me a call at 305-801-3133 or visit my website at http://www.melanieinmiami.com. Melanie Dawn Molina Wood, a Realtor with Coldwell Banker Residential Real Estate LLC, is a proud member of the US Green Building Council – South Florida Chapter and a designated Eco-Broker. She also holds her level one Green Leadership (GCREP-GL) certificate among many other certifications and awards.